Not many milestones in a persons life can surpass a Golden wedding anniversary. Set the tone with golden colored invites and be sure to send your invitations to your guests 6 weeks before your jubilee celebration. 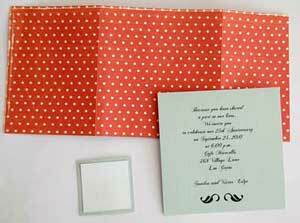 It is a good idea to keep with a traditional theme for your invitations. Choose simple stripe patterns or solid colors. Patterns like Damask, baroque and floral work well to create a vintage feel to your invites. Because this is a Golden Anniversary the color gold is often selected for 50th anniversarys. Pair the goldwith black or white for a classic invitation. Folded card - You can make a folded card with a photo of the guest of honor on the front and the party details on the inside. This can be achieved by printing of the required number of photos at a photo lab for around 15c per print and attaching them to the front of the cards. Make sure to choose a card slightly bigger than the photo for a perfect fit. You can find lovely frame clipart and decorations to embellish the card further. Look for them online. Flat card - With your photo editing software create an invitation layout with the photo at the top and the invitation wording at the bottom. You can choose amongst hundreds of free fonts that can be found online. We like to acquire our fonts from Dafont.com. A photo of their wedding day makes for a beautiful invitation. Collage invitation - Create a beautiful collage invitation with a selection of photos of the couple including a photo from their wedding day. Choose wording appropriate to your theme. Remember that your invitation sets the tone of your event so it is important to ensure to conveys the right message. to Adelaide and Midas- contact details. 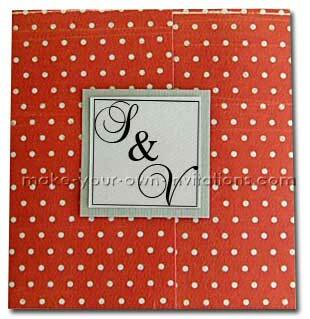 This is a simple tri-fold card made with double sided patterned scrapbook paper. How to make the card. 1. Cut the card 9½" x 4.½"
5. Use the left over pieces for the monogram squares. Print them onto the card and cut them out. The monograms squares I've used are 1½" square. Instead of a monogram you may want to stick a charm or embellishment to it. When you are happy with your square you can attach it to the left card flap.